A request for you. 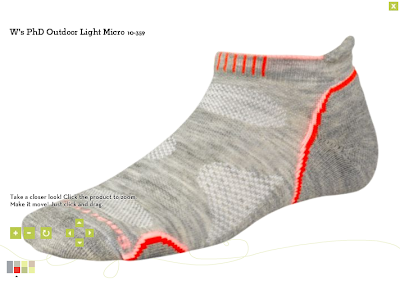 Please, pretty please look into creating quality wool running socks. I purchased my first pair of wool running socks the other day at $18 (ouch, but well worth it) by SmartWool and took them out for an 8 mile run and loved, loved, loved them. I normally am very sensitive to wool but have discovered since purchasing the Lululemon Savasana Socks that my feet love the feel of wool for some reason. Since the weather has been warming up and I’m going on longer and longer runs I’ve noticed my feet have been getting extremely itchy and hot after my runs so much so that I was up all night the other day with feet that felt like they were on fire. It’s not athletes foot but it’s some sort of rash that I used to get as a child and the featherweight socks seem to not be as agreeable to my feet these days. Anyways, enough grossness, that was my reason for splurging on wool socks in case you needed to know. The ones I got are pretty fugly compared to cute Lulu socks but I’m now convinced that wool socks are far superior. My feet remained cool without feeling clammy or sweaty and the cushioning felt really good. I’m a firm believer that if your asking your feet to run you 8 miles or more (or less of course) then their comfort should be a factor in your choice and you should baby your feet. Here is what SmartWool has to say about why wool is better than synthetics for running. These ones that I got are no show socks and made of 73% Merino Wool, 25% Nylon and 2% Elastic and were priced at $18 although that seems to have been store markup price. **this is not a sponsored post, I just really like these socks and wish lulu would make wool socks for running in and not just Savasana. "Store Report ~ Calm and Cozy Sweater, Run: Record Breaker Jacket and Special Edition Cool Racerback Tank"